People protest in Portland following the election of Donald Trump to the U.S. presidency. , others are working behind the scenes to bring about change at the local level. Jo Ann Hardesty is the president of the Portland chapter of the NAACP. Hardesty is not alone in her concerns. Juan Rogel launched a new nonprofit organization in October called Milenio. He says the group’s goal is to galvanize young Latinos. One of the biggest issues for Latino millennials is the Deferred Action for Childhood Arrivals program, or DACA. The program provides temporary relief from deportation and a two-year work permit for minors whose parents brought them to the U.S. illegally. “DACA is an executive order from President Obama. I think Donald Trump is going to try to revoke or remove this order and it’s when we are going to see a lot of millennials, a lot of young Latinos, fighting and they will be getting politically activated and that’s our mission,” Rogel said. Milenio is just one of many new organizations that have formed in response to Donald Trump. 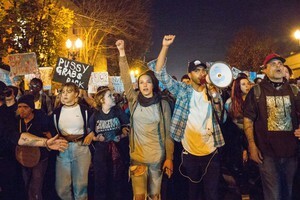 Two days after the election, several activists announced they were forming a new coalition called Portland’s Resistance. 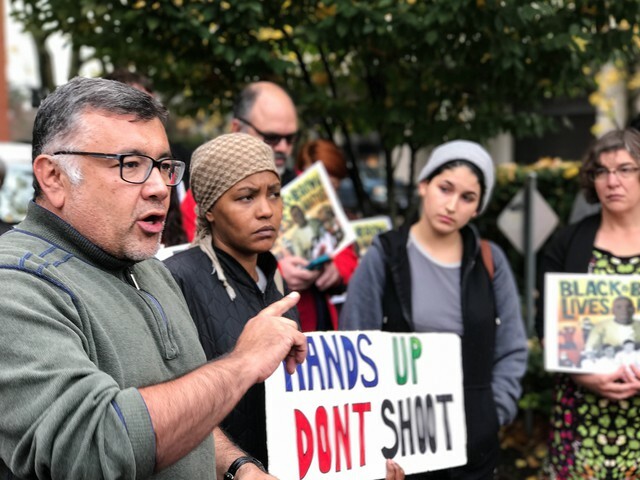 Black Lives Matter, Don’t Shoot PDX and Portland Tenants United are just some of the groups working together under this new heading. Gregory McKelvey is one of the organizers of Portland’s Resistance. 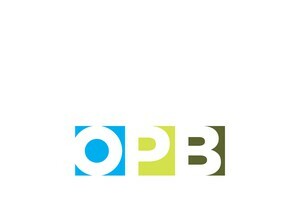 He told OPB’s “Think Out Loud” about the motivation behind the group. 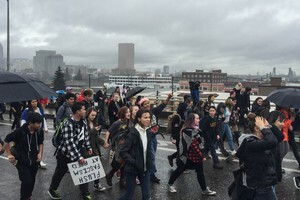 Portland activist and law student Gregory McKelvey, second from right, leads a march down Highway 99E on Thursday, Nov. 10, 2016.
during the protests, leading to dozens of arrests over the weekend. 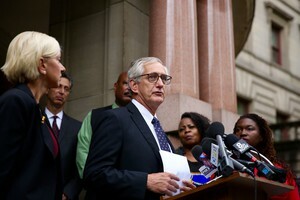 On Saturday, Portland Mayor Charlie Hales urged activists not to continue protesting. “We want people who want to protest the election to find other ways and means to express their views, put their energy, and make the change they want, and going to the streets for another night isn’t going to keep Donald Trump from taking office and isn’t going to change anything,” Hales said. Latino activists face an additional issue when choosing whether to protest publicly. If they are undocumented, they are especially vulnerable and could face deportation if arrested. Francisco Lopez is the political director of “Voz Hispana cambio Comunitario,” an organization co-founded by documented and undocumented Latinos. He says people have to come out of the shadows. Lopez says his group is joining other like-minded organizations, and that they intend to go beyond post-election protests, focusing on change at the local and state level. 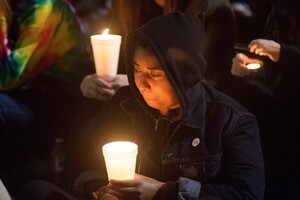 “On Feb. 1, Black Lives Matter, Don’t Shoot PDX, Voz Hispana and Milenio will go to the State Capitol, we will occupy the Oregon State Capitol and say, we want driver license restoration, we want judicial reform, we want sentencing guidelines to be revised,” he said.